Our second build in a series of passive solar quonset designs, this 3,000sf home with a 40′ x 60′ footprint features the durable, natural finish of power floated concrete, eastern white pine and galvanized steel. The spacious volume provided by a 20′ ceiling in the living room gives a sense of true connection to the outdoors, with a 12′ tall floor-to-ceiling timber curtain wall that runs almost the full width of the South elevation. With a true North-South orientation, the 7′ overhang provides complete shade in Summer, while helping to maximize Winter gains. Lunar cycles are also readily observed in the space. This building integrates lessons learned from our Extreme North Lodge Quonset on the Ottawa River. This time we doubled envelope and glazing R-values while improving insulation details. The approach taken here uses the structural steel shell as the primary interior finish that also gives fire and smoke protection, while reflecting daylight deep into the interior. The structural shell is on the warm side of the insulation which reduces heat-loss while at the same time increasing the building’s thermal mass. This provides greater resiliency in periods of power outages as the thermal delay period – or time that it takes for the interior to match the exterior temperature – is measured in days rather than hours. This simple detail also limits de-bonding at the interface of the structural shell and insulation due to reduces thermal stresses from diurnal and seasonal temperature changes. We are currently monitoring energy use and indoor air quality. This is an all-electric, carbon-neutral building (no combustion appliances or devices on site), with a measured air change of 0.46ACH at 50Pa (exceeding both R2000 and Passivhaus standards of airtightness). The building economics are significant in terms of labour and material savings over conventional construction, which by our calculations are greater than 60%, while offering a stronger, more durable, and more easily maintained structure. While a second layer of galvalume steel roofing, the building is also designed to reduce wind-driven heat-loss, promote snow retention (which adds additional insulation), and resist flame and spark from potential forest fires. It is also designed for significant snow loads and extreme wind loads (engineering data posted below). This project represents the 10th in a series of our prefabricated and research buildings that employ a strategy of material reductions called ‘Ephemeralization‘ as proposed by R. Buckminster Fuller. 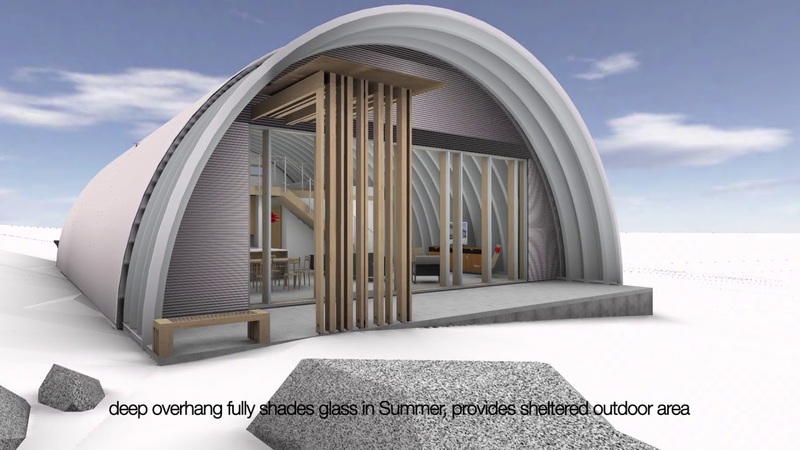 The idea is that by reducing the quantity and mass of construction materials involved in sheltering a large volume and area, an economy of material and labour can be achieved. This reduction is intended to make more resources available for everybody else, which is the central tenet of Fuller’s ‘Design Science Revolution‘. This is readily observed in the most telling measure of all – the construction cost. The turn-key price of this build is less than half that of most of the projects in our portfolio and still exceeds OBC performance requirements, while producing zero carbon emissions onsite.